I was not exactly sure where to post this, it is a finished project, but it just did not seem right for that. So the blog seems to be the “catchall” category. 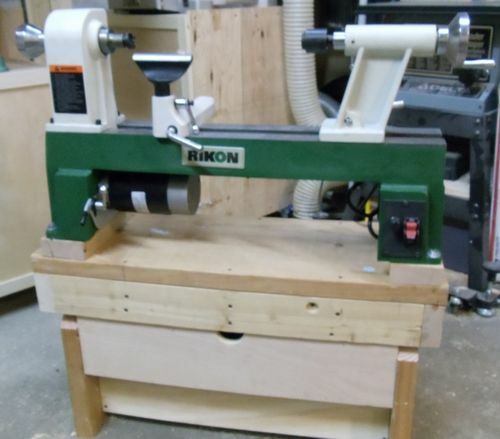 Here is a mini mini lathe stand for a 12×16 Rikon that arrived on 12/25. It was put together out of scrap wood I had around and a couple of unused drawer slides. The top has a 2×4 frame with a 2×12 top, the legs are cut from a 2×12, and both 1/2 and 3/4 ply were used for the drawer and weight box which has 50 pounds of sand in it. The one thing I did not think about is how difficult it is going to be for me to do demos. However I was able to use it yesterday for just that reason, but I definitely would not want to turn on it for any length of time. There is 50 pounds of sand in the base. 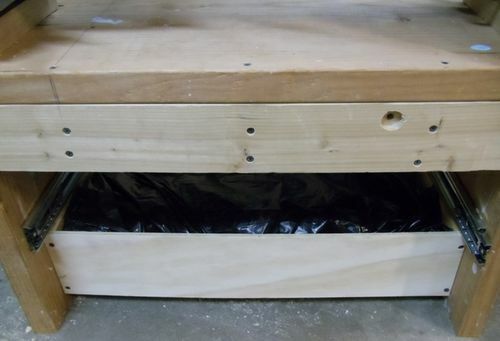 The box was not big enough to hold the sand bag as it came from the store, so I lined the box with a contractor trash bag and transferred the sand to it. Here is the proud new owner. His one disappointment is that this was finished at just about his bedtime, so he had to wait until the next morning to use it. The next morning he was ready to get to work. 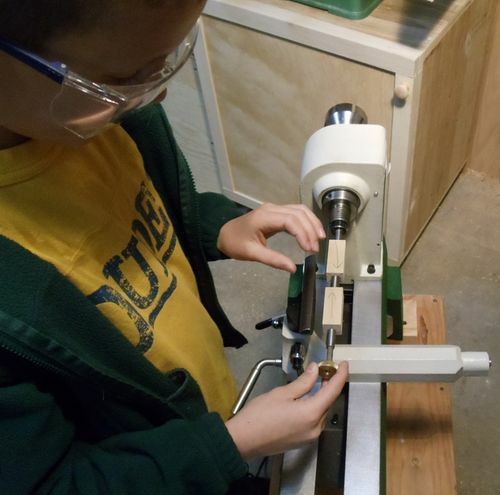 He had a custom order pencil to match a pen which had been bought a few days ago (I let him mix some of his pens in with mine at the galleries I work with, but they have his own tag and on the back an explanation that he is an 8 year old woodworker/entrepreneur, etc). Here he is with the finished product. 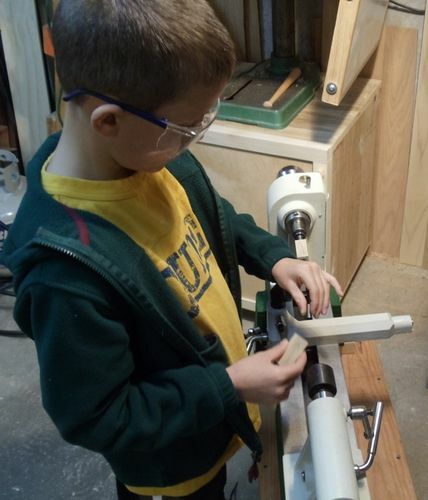 He does almost all the work including the measuring, cutting the blank on the bandsaw, drilling the blank, roughing the insert, turning, assembly, etc. The only parts I will not let him do yet are the actual gluing of the insert (I can only imagine the CA/fingers stuck nightmare), and using the disc sander to square the ends. Young man, that is a fantastic pen! Keep chargin!!!! Beautiful Pen! Keep it up!! 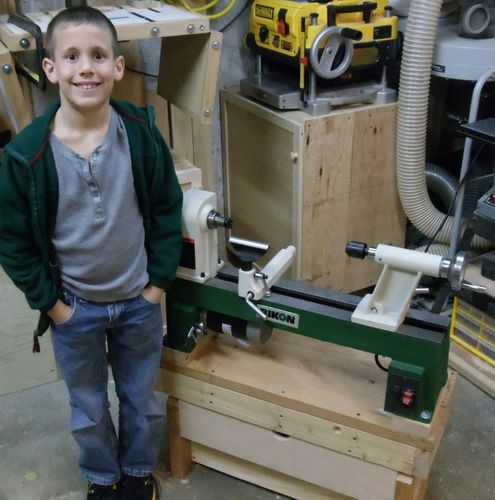 It is great that so many are bringing there kids into woodworking. 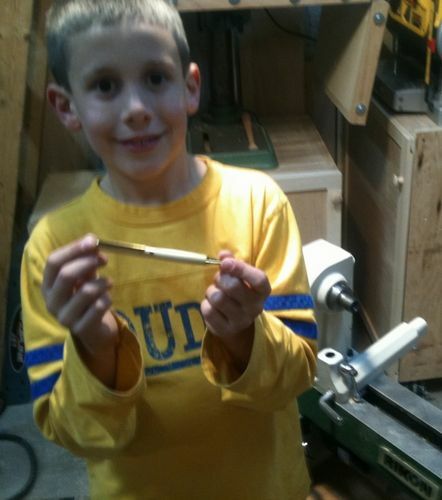 I am not a pen turner, but my son watched the demos at last years woodworking show. He may try and actually turn one next time! Great post. I like the tool drawer. The pen looks amazing. Looks like lots of family fun. 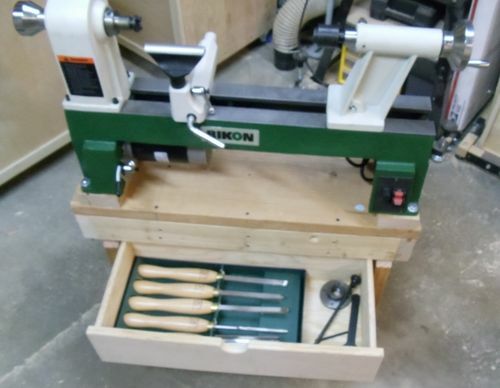 I missed this when it was first posted but found it looking for information about lathe stands. He did a great job and I do hope he is still turning. 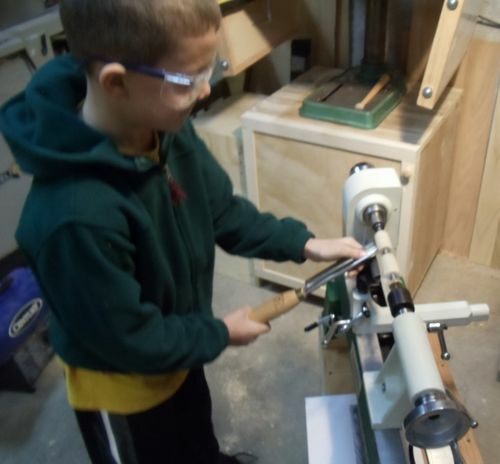 My daughter is now 7 and enjoys making things on the lathe a lot. 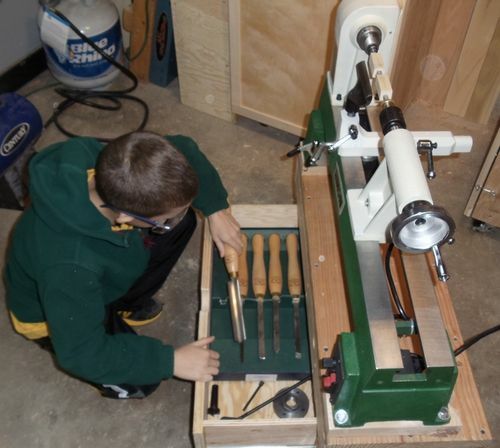 We have a new lathe for the shop and I am looking forward to getting her working on it as soon as I get a chance. Great work on the stand and thanks for the information.